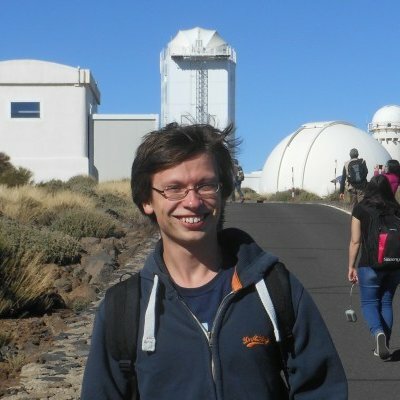 I am a PhD student in the Astronomy and Astrophysics group at the University of Warwick. My supervisors are Tom Marsh and Danny Steeghs. My PhD focuses on AM CVns, a class of He-dominated cataclysmic variables which include the shortest period binaries known. I am particularly interested in the first fully-eclipsing AM CVn, Gaia14aae. AM CVn-type binaries are laboratories of extreme physics and the dominant source of gravitational waves at frequencies detectable by a space interferometer such as LISA, as well as potential sources of dwarf novae, classical novae, type 1a supernovae, and ".1a" supernovae. They consist of a central white dwarf accreting He-rich material from a donor, which may be either another white dwarf or a He-atmosphere star. I am a regular writer for Astrobites, who summarise astro-ph papers aimed at an undergraduate level. I also volunteer for the department's planetarium, which is used on visits to local schools. "Using large spectroscopic surveys to test the double degenerate model for Type Ia supernovae" -- MNRAS (2017), 468, 2910 -- Breedt, E.; Steeghs, D.; Marsh, T. R.; Gentile Fusillo, N. P.; Tremblay, P.-E.; Green, M.; De Pasquale, S.; Hermes, J. J.; Gänsicke, B. T.; Parsons, S. G.; Bours, M. C. P.; Longa-Peña, P.; Rebassa-Mansergas, A. "PTF1 J082340.04+081936.5: A Hot Subdwarf B Star with a Low-mass White Dwarf Companion in an 87-minute Orbit" -- ApJ (2017), 835, 131 -- Kupfer, Thomas; van Roestel, Jan; Brooks, Jared; Geier, Stephan; Marsh, Tom R.; Groot, Paul J.; Bloemen, Steven; Prince, Thomas A.; Bellm, Eric; Heber, Ulrich; Bildsten, Lars; Miller, Adam A.; Dyer, Martin J.; Dhillon, Vik S.; Green, Matthew; Irawati, Puji; Laher, Russ; Littlefair, Stuart P.; Shupe, David L.; Steidel, Charles C.; Rattansoon, Somsawat; Pettini, Max. Poster: "An Update on Gaia14aae, the First Eclipsing AM CVn" (European White Dwarf Workshop, Warwick, June 2016). Proceedings.